Part 34 of Wonders of World Engineering was published on Tuesday 19th October 1937, price 7d. Part 34 includes a colour plate showing a large water tube boiler at Orgreave Colliery, near Sheffield. 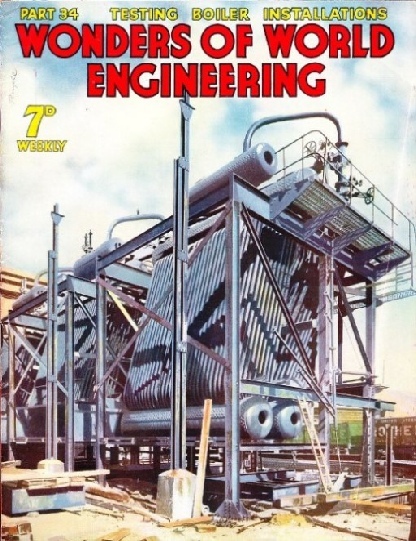 It formed part of the article on Testing boiler installations, and was also reproduced on the cover. This week’s cover, which is reproduced as a colour plate, is published by courtesy of John Thompson & Co Ltd. 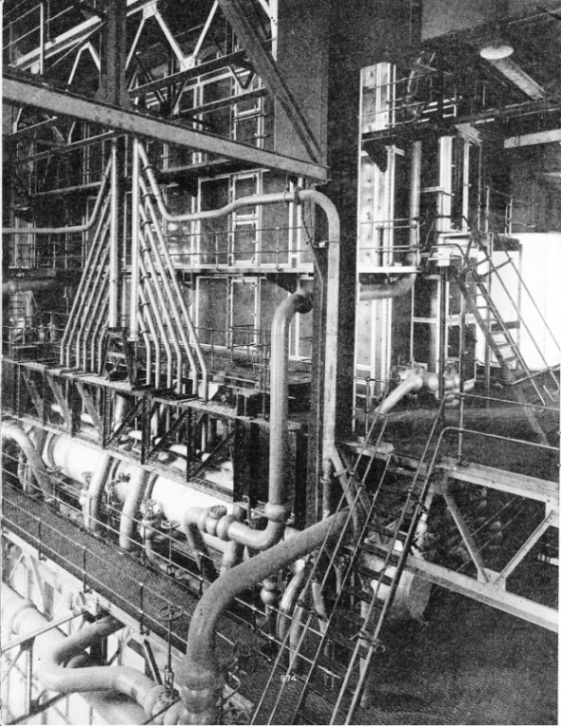 It shows a large water tube boiler in course of erection at a colliery. The principle of the water tube boiler is described in a chapter in part 30, and the methods of boiler testing are described in the chapter which begins on page 971 of this week’s Part. The altitude record for aeroplanes was raised in 1937 to more than 50,000 feet, at which height continued research is being carried out by the Royal Air Force to explore the possibility of establishing regular military and commercial flights in the upper atmosphere. This chapter, by Howard Barry, describes the systematic study of the problems involved by flying at great altitudes - in the region known as the stratosphere. For many years balloons have been ascending into the stratosphere. In 1931 Professor Auguste Piccard reached a height of 51,775 feet. By 1935 this record had been broken several times and the height attained was raised in that year to 72,395 feet. The object of balloon ascents, however, is mainly scientific, and much material relating to the physical properties of the upper atmosphere has been collected. In more recent years several high-altitude flights have been made by aeroplanes, and the Royal Air Force has been making a detailed study of high-altitude flying from the military and commercial points of view. Such research has an important bearing on future aircraft design and construction, and revolutionary developments may possibly be the result of this work. This year  Flight-Lieut. M. J. Adam, of the Royal Aircraft Establishment at Farnborough, Hampshire, reached a height of 53,397 feet in a special Bristol monoplane, and regained the aeroplane altitude record for Great Britain. This chapter describes some of the problems encountered by the Royal Air Force in its high-altitude research work. You can read about Professor Piccard’s ascent into the stratosphere in Wonders of World Aviation. TAKING OFF ON A RECORD-BREAKING ASCENT. The Bristol monoplane 138A was built in 1934. In September 1936 Squadron-Leader Swain reached a height of 49,944 feet in this plane. The record was broken again in June 1937 by Flight-Lieut. Adam, who reached a height of 53,937 feet. The efficiency of a boiler is a matter of paramount importance. Extensive test are made to find out if an installation is working at maximum efficiency, the amounts of steam generation and of fuel consumption being carefully recorded. Steam engineering is a wide subject, and one of tremendous importance. We have already had a chapter on the development of the boiler, and this chapter, by Edwin Judd, is on the testing of a boiler installation. A small boiler installation costing some £4,000 may consume as much as 4,000 tons of coal in a year, and this represents an annual coal bill of about £5,000. A small gain in efficiency may therefore involve a considerable saving. Several tests have to be made. The engineer wants to know how much steam the boiler will evaporate for every pound of coal burned; what pressure the boiler will stand; whether it is capable of maintaining the pressures demanded at “peak load” periods; and so forth. The methods of carrying out these and many other tests are briefly described in this chapter. Sidney Howard’s chapter describing how the most advanced types of mining equipment has enabled Canada’s output of metal to multiply tenfold since the beginning of this century. This article is concluded from part 33. AT THE HOLLINGER REFINERY, Timmins, Ontario. The gold precipitate, after having been treated with acid, is shovelled into special wheel pans. 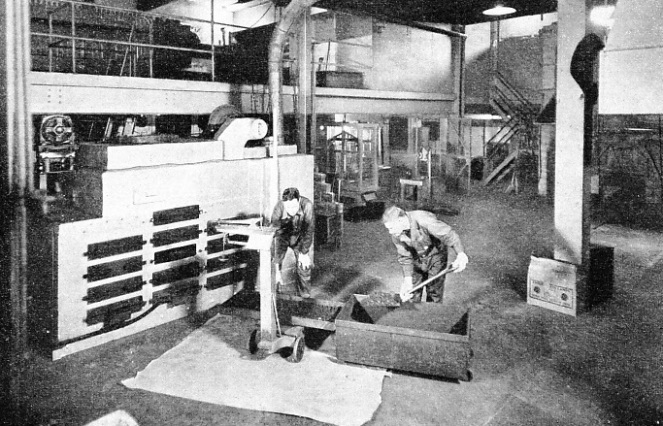 It is then taken to trays, which are weighed and placed into the slot holes of the drying oven, seen on the left of the photograph. The rivers of Sweden are inexhaustible sources of power which could be obtained otherwise only from imported fuel. The vast network of hydro-electric stations supplies electricity for the railways, industries and mines of the country. Until recent years the whole of Sweden’s railway system was dependent upon imported coal. 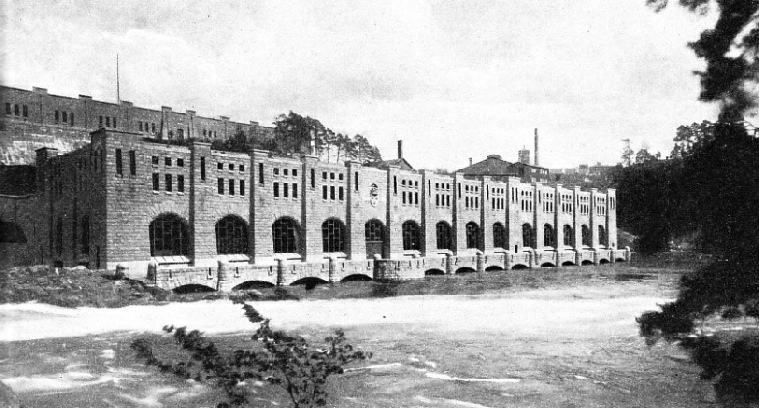 With the advance of electrical engineering during the present century, however, Swedish engineers have found that their country has many compensations for its lack of coal, and they have developed “white coal” - water power. C Hamilton Ellis, he describes some of the great modern generating stations of Sweden. The article is concluded in part 35 and is the fourth article in the series Wonders of Water Power. TROLLHATTAN POWER STATION is one of the largest in Sweden. The waters of the River Gota have been harnessed to drive thirteen great turbines. It was at Trollhattan that Dr de Laval, at the end of the last century, conducted his famous experiments in turbo-generation. The great harbours and navigable rivers of the world would soon become silted up were it not for the incessant work of the dredger. Various types of dredgers, too, are used for the building of seaports and for the excavation of the world’s great canals. 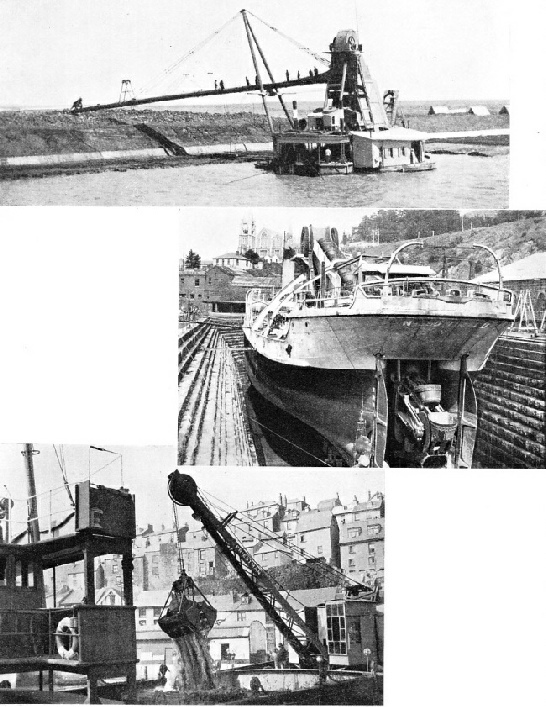 This chapter, by T C Bridges, describes some of the more important types of dredger and some of the amazing feats which have been accomplished by them. If you are interested in reading more about dredgers, there is a chapter on Dredgers and Hoppers, and on a Non-Self-Propelling Bow Well Bucket Dredger in Shipping Wonders of the World. LARGE WATER TUBE BOILER being erected at Orgreave Colliery, near Sheffield. Elaborate tests are necessary to ensure the safety and efficiency of a boiler installation. The main safety test is generally carried out at the maker’s works, where the boiler is subjected to hydraulic test pressure at least 50 per cent greater than that at which it will have to work. In addition, the steel plates and other parts have to pass stringent examination. After the boiler has been erected the principal tests of its efficiency in daily working include those measuring the steam generation and fuel consumption. 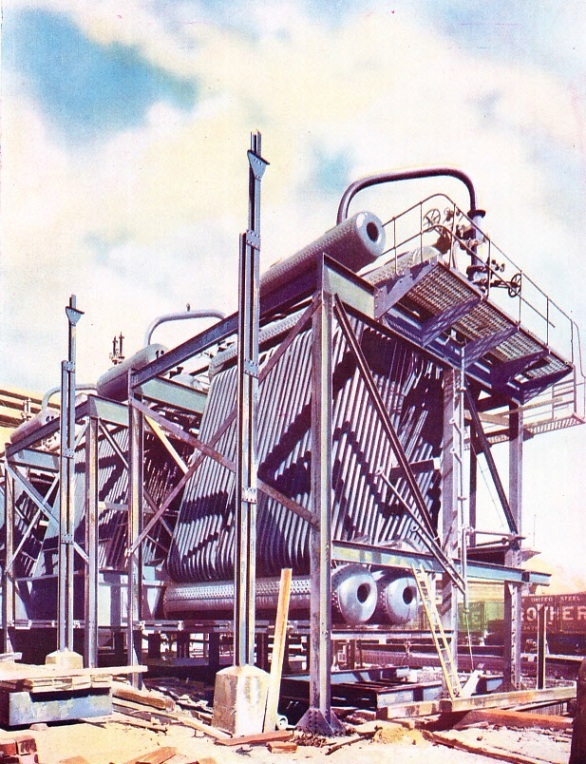 Water tube boilers are described in the chapter, Story of the Boiler, beginning on page 871. THE BOILER INSTALLATION at Battersea Power House is a remarkable example of the controlled power of steam. The furnaces burn 17½ tons of coal in an hour. The heating surface of the boilers amounts to 26,580 square feet, that of the economizers to 17,826 square feet. The introduction of an economizer between the boiler and the flue makes use of the heat of waste gases and may increase the efficiency of the boiler by from 10 to 14 per cent. The superheaters at Battersea have a heating surface of 10,920 square feet. One of their functions is to evaporate the moisture content of the steam, thus increasing the efficiency of the plant. THE SPECIALLY INSULATED COCKPIT of the Bristol 138A monoplane, designed for flying in the stratosphere. Seated in the cockpit is Flight-Lieut. M J Adam, who took the plane up to a record height of 53,937 feet on June 30, 1937. 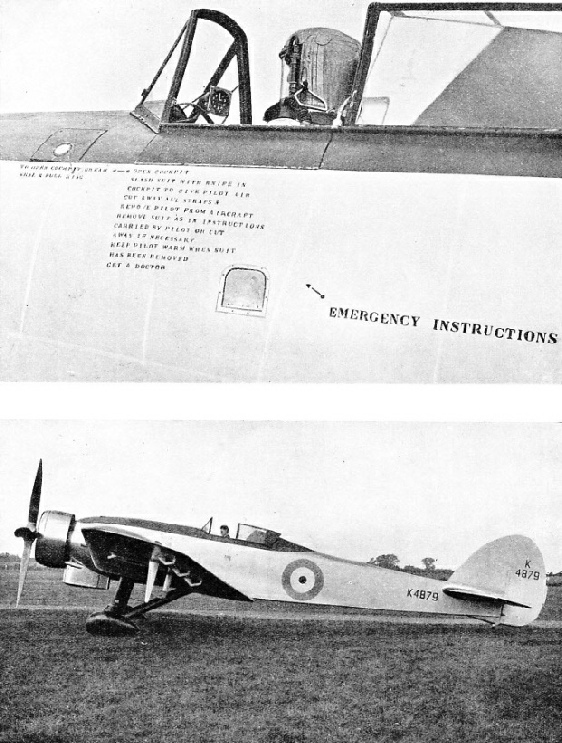 A sliding roof of transparent material enables the cockpit to be enclosed, and emergency instructions tell how the pilot may be extricated if he is unable to free himself. 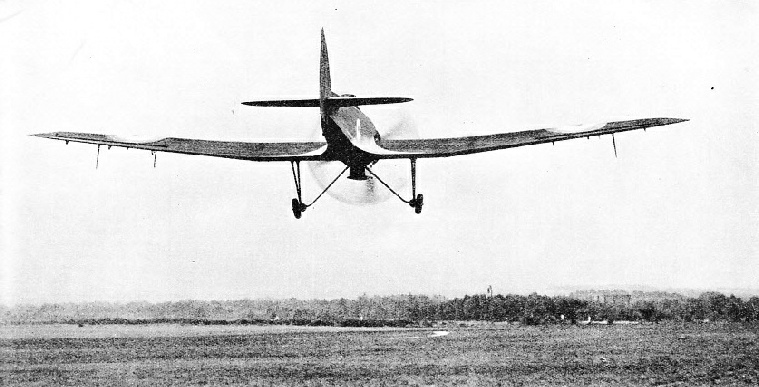 A LOW-WING CANTILEVER MONOPLANE, the Bristol 138A is built almost entirely of wood, because of the need for the lightest possible structure. The plane weighs 4,391 lb, or 5,310 lb when fully loaded for a high-altitude flight. COMBINED PILEDRIVER AND DREDGER at work in the Panama Canal. 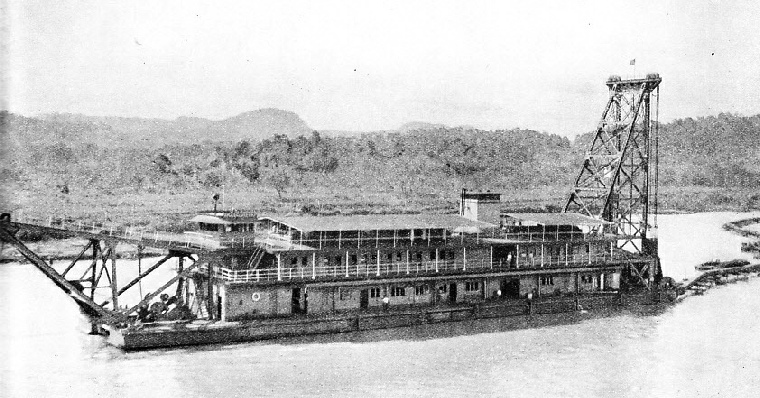 Named Las Cruces, this vessel was built in 1929. The piledriving apparatus operates from the high tower at one end of the vessel and can be used for breaking up rocky obstructions. SAND DREDGING IN THE SUEZ CANAL (top). The original excavation was carried out by low-powered dredgers and completed in 1869. In 1901, however, it was decided to widen the canal, and powerful bucket dredgers were used. In three years the width of the Suez Canal was increased by 50 feet and the depth by 2 feet. At the present day the width at the bottom of the canal varies from 196 to 328 feet, and the maximum permitted draught for vessels is 34 feet. THE CHAIN OF BUCKETS in a bucket dredger is mounted on an inclined “ladder” whose lower end projects through an aperture in the vessel’s stern. The arrangement is clearly seen in the centre photograph of the bucket dredger Timaru at Port Chalmers, New Zealand. At the top of the ladder the buckets tip over a tumbler, emptying their contents over a chute either into the hold or into a barge alongside the dredger. THE DIPPER DREDGE is a type of dredging vessel which strongly resembles a steam navvy used for land excavation. The Graball (the vessel illustrated above) is equipped with a huge grab at the end of a long swinging boom. The grab is lowered to the floor of the harbour or river being dredged, the material is grasped in the huge metal jaws, and then the grab is raised and swung inboard so that the material can be dropped into the hold.